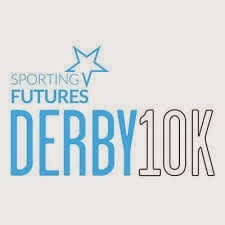 Today is the Derby 10K which L is doing but I am merely supporting. The boys are supporting with me. They have sent out the race t-shirts in advance this year, which isn’t something we approve of, unless you had a Derbyshire postcode in which case you had to go into collect it in advance. Which was a bit mean. We are probably closer than most but as we don’t have a Derbyshire postcode so they posted L’s. Generally though the organisation seems several steps up from the last time I ran the race. The course has been changed slightly with an out and back now on Pride Park before the usual loop out to the city centre and back. My father is also supporting and initially we think we’ve missed L after not seeing her even when we thought the whole field had passed us. However they had split everyone into three batches and she came through in the second one. The boys give everyone a damn good howl as they passed. I tie them to the centre of a roundabout and try to forget about them. Despite her recent (and current) injuries and illnesses she does a good time, clocking in at just over the hour. Roughly about the same time Steve McClaren crosses the line, along with the rest of the Derby County entourage. Only to find later that he must have been in a different start block. We pop in at Aston to visit my Mum before heading home. Then later heading out to the Peacock, where as well as the usual Old Peculair they have a nice stout on as well. Rather than eat out we go home for a Chinese Takeaway and share it with the boys.